Double Pomegranate Extract | Multiple Health Benefits | Buy Here! Helps fight ageing, cardiovascular disease and erectile dysfunction. Studies conducted over recent years have revealed this delicious fruit, with its subtle flavours of the East, to offer major nutritional benefits. It contains powerful polyphenolic antioxidants which appear to inhibit the development of atherosclerosis, reduce the risk of cardiovascular disease and influence the growth of certain cancers. ¤ Double Pomegranate is an extract of pomegranate (Punica granatum) that is particularly rich in potent polyphenolic antioxidants from the punicoside group comprising punicalagin, punicalin and ellagic acid. It is the presence of these polyphenolic antioxidants to which its multiple properties are attributed. Pomegranate extract has direct antioxidant activity and also helps protect endogenous antioxidant enzyme levels - catalase, peroxidase and superoxide dismutase. • by directly binding to certain toxins, rendering them harmless and encouraging their elimination from the body. Studies have shown that supplementing with pomegranate extract helps maintain a healthy lipid profile, and in particular, prevents oxidation of LDL cholesterol, an important cardiovascular risk factor. In addition, ellagic acid may combat and even reduce plaque build-up in the aorta and thus reduce the risk of thrombosis. Several studies have shown that pomegranate extract inhibits some of the harmful effects of the sun’s rays, and promotes skin protection, regeneration and healing. ¤ In this context, new studies by Japanese researchers have highlighted the effect of ellagic acid particularly in lightening skin pigmentation, giving it more luminosity and intensity, due to its inhibitory effect on the production of melanin which is responsible for skin, hair and eye pigmentation. The researchers noted that ellagic acid inhibited the proliferation of the melanocytes that produce melanin. In addition, they demonstrated that ellagic acid, a photochemical substance, acts as a DNA-protector, combatting the triggering of cancer-promoting mutations. It is in the field of cancer research that the combination of punicalagin and ellagic acid is showing most promise, particularly in relation to breast, colon and prostate cancer. ¤ Ellagic acid prevents the triggering of mutations which allow the development of cancers such as colon cancer (by inhibiting the HT29 gene) and has been shown in vitro to have anti-proliferation activity. In addition, ellagic acid inhibits two essential proteins (VEGF and PDGF) required for the formation of tumour blood vessels; they frequently interfere with the process of angiogenesis, a key characteristic of the severity of tumour development. ¤ Scientists recently demonstrated that pomegranate inhibited cell growth and induced apoptosis in highly aggressive human prostate cancer cell lines. When this research team then tested the effects of oral administration of pomegranate extract on mice implanted with prostate cancer cells, they observed significant inhibition in tumour growth. In addition, there was a decrease in the secretion of PSA (prostate specific antigen) in the animals’ serum. 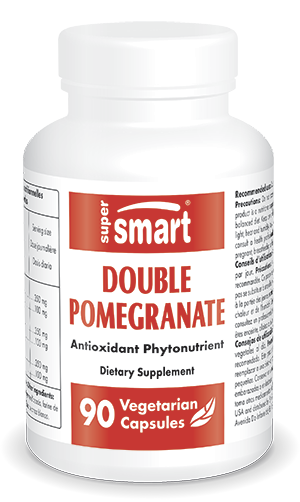 Double Pomegranate is both a cutting-edge antioxidant and one of the most health-protective natural substances available. It protects the skin and reduces the risk of cardiovascular disease and cancers of the breast, colon and prostate. Adults. Take two to three capsules a day as required or as advised by your therapist.